It doesn’t take long to have a peak at my kids’ wardrobe and know that I like a certain look for each of them. I like their dress sense to match their little big personalities. So instead of buying them what I like best I do try to buy things I think project what they are like and who they are, especially for my son as he gets older and it becomes more apparent. I love unique boutique clothes for Buba and this Hide & Peek Ahoy! Tshirt is something that would fit his sailboating heart to a tee, literally. Buba loves anything that has to do with boats and anchors. The style & print is unique, and trendy. I love the light blue colour and the funny saying on the front, “Drink Till You Drop”, so fitting. Hide & Peek are made from Fair Trade Organic Cotton too so they have that super soft fabric feel to them and you know it will be great on your baby’s skin. How adorable is this? 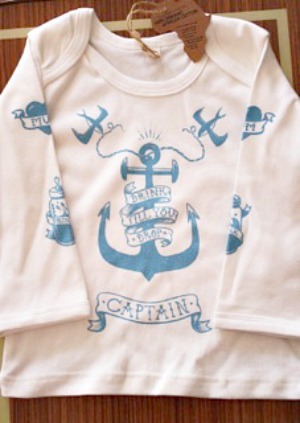 I am happy to have the opportunity to give you a chance to WIN a nautical themed 12-18 MONTH Ahoy Tshirt yourself. It would make a great Christmas present too if your little ones are past this size!What toddler doesn’t want a unique top to strut this holiday season and be called CAPTAIN? Jenny, I don’t have little munchkins, but it would be my perfect excuse to do even more shopping! I’m sure they look adorable. ‘Little people’ clothes are so extra cute. My little guy would look so cute in this. I love that it is organic cotton too!